NEW YORK -- When Kyrie Irving hit the decisive three-point shot in Game 7 of the NBA Finals that helped cement the first NBA championship for the Cleveland Cavaliers, more than 30 former players from his alma mater cheered wildly at the home of Elizabeth (N.J.) St. Patrick's principal Chris Chavannes. Irving's bond to St. Patrick's -- now officially The Patrick School -- runs deep. And in more ways than one. Not only is Irving a newly minted NBA champion who serves as a role model for all present and past St. Pat's kids, but he's also helping to keep the tiny Catholic school of 110 students afloat financially. The Larry O'Brien trophy is headed to Cleveland. The NBA champions now reside in Northeast Ohio. But New Jersey is celebrating as well. St. Patrick's lost two games in two days over the weekend by a combined 8 points. The Celtics fell to St. Anthony's, 60-56, on Saturday in the Dan Finn Classic in Jersey City. After traveling up to Springfield, Mass., on Sunday, St. Pat's then lost a tough one to La Lumiere (IN), 62-58, in OT because junior Brian Bowen went off for 29 points. So on Tuesday night, the Celtics got a visit from a special guest. WEST POINT, N.Y. -?Kyrie Irving admitted Monday he hasn't been a leader during his time in Cleveland and hopes to learn from the team's veterans, now led by LeBron James. ?I haven't been a leader ? not at all,? the former Elizabeth (N.J.) St. Patrick star?told RealGM in Chicago. NEW YORK -- Following yet another Cleveland Cavaliers' loss, Kyrie Irving addressed the latest round of reports that he wants out of Cleveland -- but stopped short of saying he will sign an extension this summer. "I'm in Cleveland, I enjoy myself," the former Elizabeth (N.J.) St. Patrick star said following his 24-point performance in the Cavs' 117-86 loss to the Knicks at Madison Square Garden. "I enjoy going out there and competing at the highest level for the Cleveland Cavaliers. And that's what it's about. It's not about me and it's not about this controversy surrounding do I privately want to come out when my contract is up. Pregame Primer: Cavaliers (2-5) at Nets (3-2), 7:30 P.M.
NEW YORK ? It wasn't pretty on Sunday, but the completion of a home-and-home sweep against the Orlando Magic got the Brooklyn Nets to 3-2 on the young season as an intriguing two-game home stretch gets started on Tuesday night. Before the Boston Celtics come to town Thursday evening, the Cleveland Cavaliers pay a visit tonight. The 2-5 record may be a bit deceiving as the Cavs have one of the NBA's electric young stars at point guard. Additionally, he is just one half of one of the league's younger and more exciting backcourts. Kyrie Irving, the reigning NBA Rookie of the Year, suffered a fractured hand Saturday and is expected to be out 6-8 weeks, according to the Akron Beacon-Journal. "I'm a little disappointed for a freak accident like that," Irving told the paper. "I have to be more responsible about my health. It was crazy. It happened so fast. That thing I did, hitting the padding on the wall, I've done it so many times. This time it was just a freak accident." The Cavaliers released a statement saying that Irving, the former Elizabeth (N.J.) St. Patrick and Duke star,? "experienced a right hand fracture during today?s morning practice after slapping the padding on the wall at the practice site. NEW YORK -- St. Patrick High School is a tiny, red-brick Catholic school of about 150 students located in the rugged inner-city of Elizabeth, N.J. Although it was supposed to close its doors for good after this school year due to financial struggles, school officials hope to keep it open by moving it to another, as yet undetermined location in the port city. NEW YORK -- A year ago, Kyrie Irving was the consensus No. 1 pick in the NBA Draft. This time around, Irving was on hand at the NBA Draft Lottery only as an interested bystander. Decked out in a black suit and bow tie, the NBA Rookie of the Year was hoping his Cleveland Cavaliers would defy the odds and land a second straight No. 1 pick even though they entered in the No. 3 slot. Instead, the Cavs will pick at No. 4, behind New Orleans, Charlotte and Washington. If you haven't yet seen this Pepsi MAX commercial featuring NBA Rookie of the Year and St. Patrick High School alum Kyrie Irving, check it out. Irving follows in the footsteps of Larry Johnson as "Grandmama" in a Converse sneaker ad and LeBron James as "The LeBrons" in a Nike commercial among Rookies of the Year with their own commercials. According to a report from Matt Steinmetz of CSNBayArea.com, Knicks guard Jeremy Lin will play for the USA Select team this summer against the U.S. Olympic team. Joining Lin on the team will be Kyrie Irving, the newly minted NBA Rookie of the Year, and former Kentucky stars John Wall and DeMarcus Cousins, among others. Kyrie Irving, who began his high school basketball career at tiny Montclair (N.J.) Kimberley Academy and finished up at powerhouse St. Patrick, will be named the NBA Rookie of the Year, according to reports. Irving, who led all first-year players in scoring at 18.5 points per game, will receive the award Tuesday, the AP reported. "I would imagine it's something you dream about as a kid working out with all the time and effort you put in," former St. Patrick and current Montverde (Fla.) Academy coach ?Kevin Boyle?told SNY.tv. ? "He was blessed with some talent but what people don't realize is he's an example of a guy who really loves to play and really worked hard. He put a lot of time in the gym. Kyrie Irving won't play for Australia this summer in the London Olympics and said he hopes to be a part of Team USA for 2016. Yet Irving clarified earlier remarks about Team USA Coach Mike Krzyzewski's future, saying he's not certain if Coach K will lead the Americans four years from now. "I spoke to Coach K [and] he did tell me he was coaching, but I prematurely spoke on that," Irving, who played for Coach K at Duke last season, told the Cleveland Plain Dealer. "But I know he's going to be part of USA Basketball. That's the most important thing. That's what made my decision easier. NEW YORK -- Kyrie Irving?is actively working to help his alma mater, Elizabeth (N.J.) St. Patrick, out financially, but Al Harrington and Sam Dalembert are not, Celtics head coach Chris Chavannes told SNY.tv. "We have faith that Kyrie will help St. Patrick," Chavannes said, referring to the Cavaliers rookie point guard and the No. 1 overall pick in last year's NBA Draft. "They have been very pro-active." The same is not true of St. Patrick alums Harrington, whom St. Pat's principal Joe Picaro used to drive to school, and Dalembert, Chavannes said. Kyrie Irving returned to his alma mater Tuesday night and he brought more than his jaw-dropping basketball skills. He brought some valuable lessons for the young St. Patrick players as well as a promise to donate some of his earnings to the struggling Catholic school. "He's very, very helpful in so many ways," St. Patrick coach Chris Chavannes told SNY.tv. "And he's made his promise to also help out the school financially in the very, very near future." ELIZABETH, N.J. -- Only a handful of onlookers were there Monday evening when Kyrie Irving drained four straight 3-pointers, two from midcourt, in the bandbox that is the St. Patrick High School gym. "He's shooting the shot from halfcourt like it was [nothing]," said Darrian Collins, a rising 5-foot-9 junior guard from St. Pat's. Kyrie Irving has filed a harassment complaint with the West Orange (N.J.) police saying he was being threatened by a woman he met through Twitter, according to multiple reports. According to MontclairPatch.com,? Irving, the No. 1 pick in last month's NBA Draft, said in the police report he received "terroristic threats" from Jackson between March 22 and May 17. He filed a harassment complaint May 17. NEWARK, N.J. -- Tristan Thompson said Wednesday he was looking forward to dunking on Kyrie Irving in the NBA. 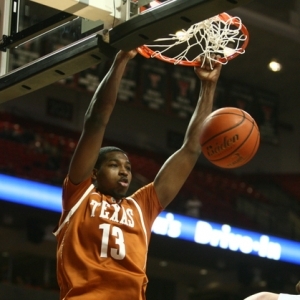 Now that the two are teammates with the Cleveland Cavaliers, Thompson will only get to dunk on Irving during practice. "I'm really looking forward to it," Irving, the former St. Patrick and Duke star who was taken No. 1 overall by the Cavs, said of playing with the 6-9 Thompson, selected minutes later at No. 4. NEW YORK -- Tristan Thompson was asked Wednesday if there was a certain NBA player he was looking forward to dunking on once he joins the league. "Hmm," the 6-foot-9 Thompson pondered, "I probably want to dunk on Kyrie." Thompson still owes one to Irving from their days as New Jersey prep stars. Nearly a year after losing LeBron James to "The Decision," the Cleveland Cavaliers got a major boost Tuesday night when they won the No. 1 pick in the June 23 NBA Draft. The Cavs will likely choose between Duke freshman point guard Kyrie Irving and Arizona sophomore forward Derrick Williams. Kyrie Irving will enter the 2011 NBA Draft with plans to hire an agent, Duke coach Mike Krzyzewski announced Wednesday. DraftExpress.com projects the 6-foot-2 West Orange, N.J. native as the No. 1 overall pick in the June 23 draft in Newark. One veteran NBA scout, however, told SNY.tv he would choose Arizona's Derrick Williams with the No. 1 pick. NEWARK -- Kyrie Irving and Dexter Strickland played only half a season together at Elizabeth (N.J.) St. Patrick High School. Yet in their short time together on the court, they made a historic impact. The duo led the Celtics to the New Jersey Tournament of Champions title in 2009, the school's third in four years under head coach Kevin Boyle. Kyrie Irving will come off the bench and see "significant minutes" Thursday night when Duke meets Arizona in a West Regional semifinal, Duke coach Mike Krzyzewski said Tuesday. After missing 3 1/2 months with a right big toe injury suffered Dec. 4 against Butler, Irving came off the bench to score a team-best 14 points when Duke routed Hampton, 87-45, last Friday. The former Elizabeth (N.J.) St. Patrick star then hit a critical late basket and scored 11 points in 21 minutes in Sunday's win over MIchigan. "We're good with who we're starting," Krzyzewski said, according to the Charlotte Observer. "We should have at least eight people feel like they're starters on this team, with Andre [Dawkins] and Ryan [Kelly]. We've had nine people start on this team, so that's an advantage. WASHINGTON, D.C. -- If Duke wasn't the favorite to win back-to-back NCAA championships before the Big Dance began, they should be now. That's because freshman guard Kyrie Irving made his triumphant return Friday, scoring 14 points and dishing four assists as No. 1 Duke routed No. 16 Hampton, 87-45, in a second-round West Regional game in Charlotte, N.C.
"I haven't played in three months, so this game was really nerve-racking," Irving said. "But once I got the butterflies out, I started to play really well." WASHINGTON, D.C. -- Duke coach Mike Krzyzewski said Kyrie Irving will play Friday in the Blue Devils' NCAA tournament opener against Hampton in Charlotte, N.C. Speaking to reporters Thursday, Krzyzewski said Irving will not start and will play "limited minutes'' when the No. 1 seeded Blue Devils meet the 16th-seeded Pirates. The West Orange, N.J. native has been out since Dec. 4 with an injured big toe on his right foot. Duke Coach Mike Krzyzewski acknowledged Tuesday that Kyrie Irving may return to the Blue Devils during the NCAA Tournament. "There is a chance Kyrie will play," Coach K said, according to a Tweet from the Duke Chronicle. Irving's return would definitely bolster Duke's chances of repeating as NCAA champions. Though just a freshman, he is arguably their best player and will likely be among the top several picks in June's NBA Draft. Duke freshman point guard Kyrie Irving is now out of his walking boot for good, but it remains unclear if he'll play again this season. Irving tweeted on Friday: "I'm now retiring my walking boot officially...back to regular sneakers lol...feels good!!!" Duke coach Mike Krzyzewski said the West Orange, N.J. native has been cleared for "a few basketball-related activities" as he recovers from the toe injury suffered Dec. 4 against Butler at the Izod Center. The trash talk was flowing fast and furious at last year's McDonald's All-American Game. Surrounded by three future North Carolina Tar Heels, Kyrie Irving grabbed the microphone and put things in perspective. "First and foremost, UNC is in the NIT," the Duke-bound Irving told DraftExpress.com as Harrison Barnes, Kendall Marshall and Reggie Bullock sat next to him. NEW YORK --During St. John's stunning 93-78 upset of No. 3 Duke Sunday afternoon at Madison Square Garden, a group of little boys in St. John's jerseys tried to get Kyrie Irving's attention by shouting his name toward the Duke bench. Irving didn't acknowledge them and remains glued to the bench for the foreseeable future because of the toe injury suffered Dec. 4 against Butler. "We?re not looking for him to come back, we?re looking for him to get well," Duke coach Mike Krzyzewski said. NEWARK, N.J. -- Kyrie Irving may be on the shelf with a toe injury, but Syracuse coach Jim Boeheim says the Blue Devils are still the team to beat. "Duke, to me, without Kyrie are just slightly better than everybody else," Boeheim said after the No. 4 Orange improved to 16-0 Saturday with a 61-56 win at Seton Hall. "Maybe even a little better than slightly better. With him, obviously, they were clearly in my mind the best team. But I'm not sure they're still not the best team." The Atlanta Tip-Off Club released the Naismith Boys Watch List on Thursday and three Kentucky commits made it -- Michael Gilchrist, Marquis Teague and Anthony Davis. Duke signee Austin Rivers and Baylor signee Quincy Miller are also on the list. NEW YORK -- Celtics coach Doc Rivers said his son, Austin, hopes to team with Kyrie Irving next year at Duke. Austin Rivers is a 6-foot-3 shooting guard from Winter Park (Fla.) who signed with Duke last month. If he and Irving were to play together, they could form one of the most explosive backcourts in the nation. "Oh yeah, he's hoping to play with Kyrie," Doc said Wednesday before the Celtics-Knicks game at MSG. "That still may or may not happen, whether he's injured or not. But I'm just hoping Kyrie is back and healthy. He's a terrific player." Duke freshman point guard Kyrie Irving has a "serious" toe injury and could potentially miss the remainder of the year, Duke head coach Mike Krzyzewski said. "Kyrie's injury is a serious one," said Krzyzewski, who moved into third place on the all-time wins list behind Bob Knight and Dean Smith after Duke's 83-48 win over Bradley Wednesday night. "It's being evaluated by our medical team here at Duke and with medical people from different parts of the country who are experts in foot injuries. Some type of analysis should be done hopefully by a week to 10 days and a course of action will be taken based on that analysis. Duke announced Wednesday that freshman Kyrie Irving of West Orange, N.J. is out indefinitely after suffering a toe injury on his right foot in last Saturday?s win over Butler. No timetable has been set for his return as Irving will undergo rest and rehabilitation while recovering from the injury. ?Kyrie is going to miss an undetermined amount of time with the toe injury,? said head coach Mike Krzyzewski, whose team hosts Bradley Wednesday night on ESPN2. ?Our medical staff will continue to monitor the recovery process and he will return to action once it has sufficiently healed. Kyrie is an outstanding player and we are confident that he will bounce back from this setback.? Irving is off to a terrific start in his freshman season at Duke reaching double-figures in scoring in all eight games. The three-time ACC Rookie of the Week selection is the third leading freshman scorer in the country at 17.4 points per game and also ranks in the top 10 of the ACC in six statistical categories (scoring, assists, field goal percentage, free throw percentage, steals and assist-to-turnover ratio). 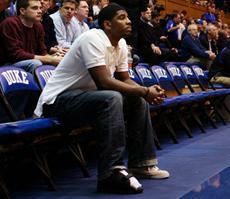 Duke freshman guard Kyrie Irving is in a precautionary walking boot and could miss Wednesday's game with Bradley. "[He] sat out practice today [Monday] and [is] still being evaluated," a Duke spokesman said by text. "Safe to say he could miss Wednesday's game." EAST RUTHERFORD, N.J. ? With Duke clinging to a three-point lead against a gritty Butler team Saturday afternoon at the Izod Center, Kyrie Irving went to work. Irving, the star freshman making his first appearance in the Garden State since arriving at Duke, drained back-to-back 3-pointers to put the No. 1 Blue Devils up by nine points and Duke held on for an 82-70 victory before 14,215 in the rematch of the NCAA championship game also won by the Devils. ?Those were rhythm threes and it felt good,? said Irving, who scored 17 of his 21 points in the second half, when Duke outscored Butler 49-37 to break a 33-all halftime tie. Tony Jones first saw Kyrie Irving play basketball as an 8th grader and at that stage he already sensed? something special about the kid. "You could tell that he had skills that belied his age," said Jones, the longtime coach at Montclair (N.J.) Kimberley Academy. "He was always very skilled. "His dad being a pretty elite player in his own right really helped him." NEW YORK -- It isn't exactly The Beatles playing Shea Stadium, but Duke and Gonzaga will draw a crowd Monday in Kansas City. Some 43 NBA scouts have requested credentials for the O'Reilly Auto Parts CBE Classic Championship Round to see players like Duke's Kyrie Irving and Kyle Singler and Gonzaga's Steven Gray. "Forty-three is a lot," said Ray Cella of the Gazelle Group, which is putting on the event Monday and Tuesday. "Obviously, when you get quality teams coming to one place everybody wants to come out." NORTH AUGUSTA, S.C. ? The way Roy Williams sees it, Kyrie Irving has helped Duke launch ahead of North Carolina in two ways. First, Irving played the point his senior year at Elizabeth (N.J.) St. Patrick, preventing current Carolina sophomore Dexter Strickland from doing so. Then Irving went ahead and committed to Duke, the defending NCAA champions. The USA U18 team made its cuts Wednesday and is now down to 12 players. The 12 finalists include: Vander Blue, Trevor Cooney (pictured), Abdul Gaddy, Josh Hairston, Kyrie Irving, Quincy Miller, Tony Mitchell, LeBryan Nash, Jereme Richmond, Austin Rivers,? Amir Williams and Patric Young. "It feels great and the team is very balanced and talented," Irving, who is headed to Duke, said by text. NEW YORK --After winning the NCAA championship last month in Indianapolis, you wouldn't think Duke coach Mike Krzyzewski would want to change too much. But Coach K says the addition of a single player to the 2010-11 version of the Blue Devils will? transform the team's entire offense. "We'll change our whole offense, the way we play because of Kyrie," Krzyzewski said Wednesday at the New York Athletic Club, referring to incoming freshman point guard Kyrie Irving of Elizabeth (N.J.) St. Patrick High School. NEW YORK -- When Dexter Strickland committed to North Carolina as a junior at Elizabeth (N.J.) St. Patrick, Tar Heels head coach Roy Williams figured Strickland would play point guard during his senior season of high school. But when stud point guard Kyrie Irving transferred to St. Patrick from Montclair (N.J.) Kimberley Academy, Strickland continued to play shooting guard as the Celtics won the 2009 New Jersey Tournament of Champions. Now a freshman at North Carolina, the 6-foot-3 Strickland continues to adjust to life as a floor general for the 2009 NCAA champions. Josh Selby will announce his college decision right here in the Big Apple during the Jordan Brand Classic April 17. The 6-2 senior point guard from Baltimore (Md.) Lake Clifton lists Kansas, Kentucky, Arizona and UConn as his final four, but Tennessee coaches Bruce Pearl and Steve Forbes recently went to watch him play. ?At one time Josh was going to announce his decision when he finished his visits,? Selby?s mother, Maeshon Witherspoon, told Rivals.com. ?Now we are waiting ?til the Jordan Game, so we can see how all the teams play in the tournament. It has nothing to do with us being concerned with what Brandon [Knight] is doing.? Duke-bound point guard Kyrie Irving and Western Kentucky commit Derrick Gordon combined for 25 points to lead St. Patrick over Union 64-47 in the semifinals of the Union County tournament Wednesday night in Elizabeth, N.J.
Michael Gilchrist added 9 points, 14 rebounds and 3 blocks. The Celtics are in the final for the 18th straight year and will face Tyrone Johnson and Plainfield Saturday at 3 at Kean College. Alex Kline of BoxofMess.com continues to put in work interviewing many of the top high school prospects in the New York metropolitan area. In this piece, Kline gets Burlington (N.J.) Life Center stars Dion Waiters and LaQuinton Ross talking about their future goals and plans. UNION, N.J. -- Two schools in hot pursuit of Cory Joseph squared off on ESPN's "Big Monday," with UConn knocking off No. 3 Villanova, 84-75, at the Wachovia Center. Joseph, a 6-foot-3 senior guard from Findlay (Nev.) Prep ranked No. 3 among point guards in 2010, was not at the game but he is considering both UConn and Villanova, along with Texas, Minnesota and UNLV. "[I'm just gonna commit] whenever I feel 100 percent. . . . I am not sure if I am gonna pick out of the [full list of] five. I have no set time," Joseph told Alex Schwartz of Rivals.com while playing this past weekend at the Primetime Shootout in Trenton, N.J.
ROBBINSVILLE, N.J. -- Illegal workouts for big-name college coaches...secret videotapes made by former state troopers turned undercover private investigators...complaints about illegal recruiting from a former NBA player with a checkered past...fiery speeches, threats of lawsuits and name-calling that includes the use of "fascist" and "terrorist"... all in the name of high school basketball. As expected, Elizabeth (N.J.) St. Patrick was officially banned from the New Jersey state basketball tournament and put on two years probation Friday by its state association. Head coach Kevin Boyle, found guilty of holding illegal preseason workouts - so his players could be seen by college coaches - was suspended for three games. The McDonald's All-American rosters are out and, as first reported by ZAGSBLOG.com, four players with New York ties have been invited. Villanova-bound forward JayVaughn Pinkston of Bishop Loughlin, Tennessee commit Tobias Harris of Half Hollow Hills West, Duke-bound guard Kyrie Irving of St. Patrick and Queens native Doron Lamb of Oak Hill Academy will play in the game March 31 at the Value City Arena in Columbia, Ohio. "I'm the first [player] from my school to make the McDonald's game; that's big," the 6-foot-5 Pinkston told Chris Lawlor of ESPN.com. "In the end, it's not about individual stuff but getting the 'W.' You take nothing for granted; I did my talking on the court." Kyrie Irving and Michael Gilchrist combined for 46 points Saturday night as Elizabeth (N.J.) St. Patrick hammered Woodland Hills (Calif.) Taft, 91-64, in the Nike Extravaganza in Santa Ana, Calif. The Celtics won despite a huge controversy swirling around the program. St. Patrick will be declared ineligible for the upcoming New Jersey state tournament at a New Jersey Interscholastic?Athletic Association?hearing this week because it allegedly held illegal preseason practices, according to a source with direct knowledge.